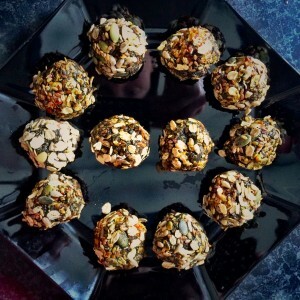 I really like these Spirulina and Ginseng Bounce energy balls that you can buy from health food shops but they are mega expensive. Today I used all my energy making my own version of the energy balls. They consisted of nuts, seeds, dried fruit, oats, spirulina, cocoa and honey whazzed together in a blender and they tasted like bird food and fish food for humans.